It’s becoming increasingly well-established that microbes behave differently in microgravity than on Earth… that’s one of the justifications for our own Project MERCCURI. Some previous work has focused on the ability of microbes to survive higher-than-normal levels of antibiotics when grown in space, though the mechanism for this is not at all understood. 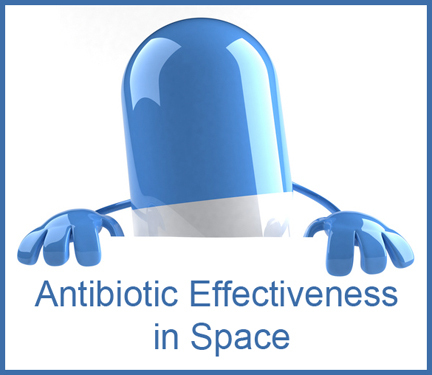 The Antibiotic Effectiveness in Space (AES-1) investigation, scheduled to launch in January aboard the first contracted Orbital resupply flight to the space station, is a systematic attempt to probe the reasons for antibiotic resistance in space. “Is the mechanism that’s allowing this to occur some form of adaptation or drug resistance acquisition within the cell, or is it more of an indirect function of the biophysical environment, the changes due to microgravity and mass transport?” asked AES-1 principal investigator David Klaus, Ph.D., of BioServe Space Technologies at the University of Colorado in Boulder.